Camco Manufacturing specializes in products for campers, RV's, and people who love outdoor activites. This "Little Red Campfire" is pretty neat. If you are camping where inground fires are restricted, if want a toasty fire in your backyard but don't have a fire ring, or if you want to be the envy of your fellow tailgators at the next football or baseball game you attend. 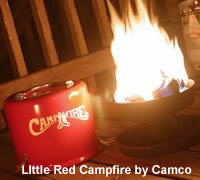 The can contains log pieces that look real to help recreate the same ambiance that a real campfire does. It uses standard LP gas and is RV campground approved. To read more about it or to order one, visit Camco's website.